With the anniversary of the start of the First World War next year there is a lot of work going on to make records from that period more accessible. "Find a soldier's will" is a new service from the government which aims to make it possible to search for and download a soldier's will on-line. Coverage is for serving soldiers who died between 1850 and 1986 and who left a will at the time of their death. It seems possible (hopefully) that the service will expand in the future to include all wills. 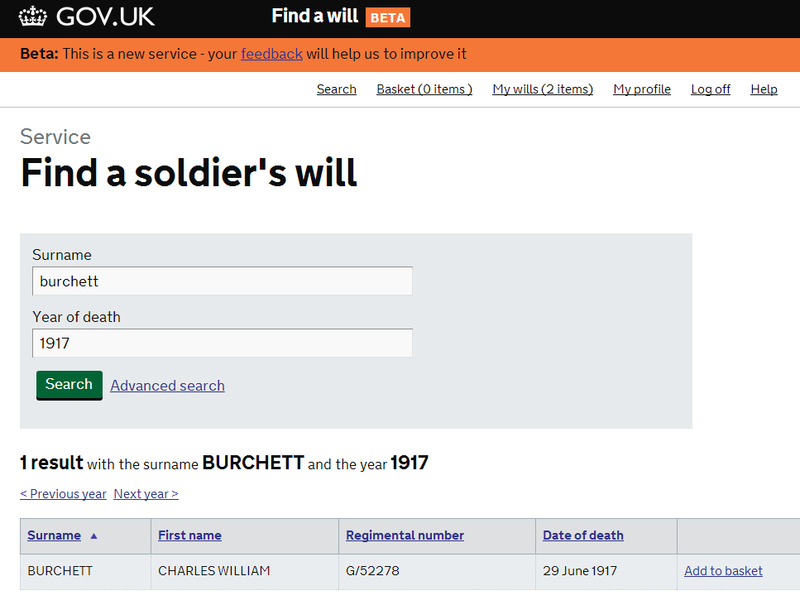 To search you need the soldiers surname and the year he died - if you don't know when he died you can search each year (and there is a handy link to search the previous or following year so you don't have to keep entering the year). If you have more information you can search using the service number and forename to narrow down your search. Each will costs £6 to download and it takes time - up to 10 days before it will be available. I suspect, as it is early days, the wills are being uploaded as they are requested and not in advance. Hopefully in the future they will be available immediately. As the website says this is the beta version so it will no doubt change but hopefully not much as it is a nice clear, uncluttered site, easy to use and to understand. Although I know of several members of the family who died in both World Wars there are no entries for them. It is not clear if this is this because they didn't leave wills or because they have yet to be added to the index? All told this is a great addition to First World War information online.